Of all the Vegas engagements Elvis gave this season must be ranked as one of the best. Maybe not so much for Elvis himself as he was certainly not in the best shape of his life for various reasons during this time, but for the fans he really tried to do something different. Elvis' shows were longer than normal, he talked a lot more between songs as the season progressed and gave the odd karate demonstration. He must have been a nightmare for the managers of the Hilton, as he explains why on this CD "after Polk Salad" and in other shows during this engagement. So with the re-decorating, shows running over the 50 minutes, turning up late for shows and the papers telling of the drugged up Elvis and that's just what we know about, what else was he up to that we don't know about. I'm sure the Hilton was glad to see the back of him after the closing show, although he did hand around a little after to catch a few shows in Vegas before departing from the Hilton. Basically for fans that saw him often got something special in August and September of 1974, and if I could go back in time I would go back to this time period and watch everyone of these shows. 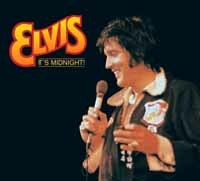 All the shows are available on the audio circuit recorded by the audience and this show is one of the better sounding ones, you can really get the feeling of the changes in Elvis as the nights move along listening to these shows. But we also have the Opening show on soundboard and of course the famous Closing show too which listening to both shows one after the other you would find it hard to believe they were recorded only two weeks apart. Elvis was in fine voice for the most part even if his health wasn't. He still looked stunning on stage although a touch over weight, and he wore some stunning jumpsuits during this engagement. Basically this show is a joy to listen to on soundboard as you can hear just a little more of what Elvis had to say, and during the introductions he tells everyone what he uses for nose bleeds if that don't make you laugh I don't know what will.. The second release from this label, it is an improvement to the audience recording doing the rounds, this CD is very close to Soundboard quality. 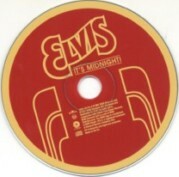 Not Elvis at his best but it's still Elvis in concert and concert fans will enjoy the show if only for the sound. The show is slight better than other shows in this tour, Elvis gets through around 14 seconds of "Rip It Up" before he cracks up, the other unusual number, is a 1 minute 20 second version of "The Wonder Of You" but not the best version he ever gave. On the CD you get eight bonus tracks all fairly rare live recordings from 1970 - 1976. This is an average release for a CD, especially for fans that are so used to the Soundboard recordings these days. This one CD should be ranked as good as any of the excellent audience recordings we have had over the years, and is a worth addition to your collection. Running time 76 minutes approx. U.S Male with "Wings Of An Angel" isn't very new to anyone these days, but this release is a little special as it contains all the takes for U.S Male for the first time on CD. Also all the tracks are in excellent sound quality, compared to previous CD releases. Some of the takes have been around for a while on the audio circuit but nothing compared to this little gem, there are a number of takes still unreleased too, so we are treated to an upgrade in sound and have all possible takes compiled in order. Just a shame this wasn't released years ago. When saying scattered over 3 or 4 CD's this is just a guide to the minimum number of CD's you would have to get together to listen to the takes that are available so far. Two surprise releases on a new label "Union Records" this label is a CD-R but like a few others of late a lot of trouble has gone into the making of these CD's they are "Silver On Silver". Which means they look just like the original CD you buy ion the shops, unlike the usual CD-R's with the coloured dye on the bottom surface. These discs also have on board printing. The only down side to these two releases is the covers especially the "High Spirit In Las Vegas" it looks like it has just come from someone's printer. The other is slightly better but the colour picture on the inside is terrible, but it's the content that counts and it is something new in very good sound and not from June 1975! Although both are supposed to be Soundboards, as stated on the CD's. I think at least one may be a top class audience recording, if it is an audience recording it would put many Soundboards to shame. The only one that sounds like it may be an audience recording is "Getting Down To Business" as you hear a couple of females talking during the 2001 theme, but over the coming weeks we will hear more on the sound. One other thing that may prove it's not is that there is no record of this one being a soundboard but that proves nothing. Still both have similar sound and both Elvis puts his on a fine show and will be a great addition to the collection as they are far superior to the audience recordings doing the rounds. One last point "Getting Down To Business" states the show is from August 30th 1973 Dinner Show, but looks more like the August 31st Dinner Show. Elvis in concert recorded on Soundboard at the Notre Dame University Convention Centre, in South Bend. We have had the opening shows from this tour already on soundboard "Chicago Beat - October 14th & Bringing The House Down - October 15th". Both shows were by far a long way from Elvis' best shows from 1976 and this one is no exception. Here we join Elvis halfway through this tour no great change to the song line up, in fact the only change is "Little Darling" which Elvis through in at the end of the show at a couple of shows during this tour, but here he is asked to do the song by a fan after "Jailhouse Rock" although Elvis already had in his mind to do "Help Me" but he promised he would do it later, and true to his word he did. At the beginning you hear a few sound problems to which Elvis points out its his fault as he only paid $2.50 for the system. This concert is a straightforward run-through of the songs very little dialogue from Elvis, but still it comes over very well and it is enjoyable to listen to. The fans that attended the show seemed to love it, as Elvis had by now mastered a way of hypnotising the crowd into a state of awe, and it seemed he could do no wrong, and for the most part this continued right up to June 25th 1977. Which also was a shame because Elvis needed to be told a few home truths about his act and only a little poke from Bill Burke in December '76 spurred Elvis into proving he could still put on some stunning shows and he did on his final tour of '76. But that was short lived! It's hard to say today whether his shows from around this time period were poor or just run of the mill as a soundboard doesn't tell you everything, they only give a small look into the stage act. But there was no stopping Elvis' pulling power, to his concerts. Tickets for this show went on sale back in September, and on September 21st at 11:pm the evening before the tickets went on sale there was a 250 fans waiting for the stand to open. The highlights of the show were "Steamroller Blues & You Gave Me A Mountain". The show is a must for the soundboard fans who want everything, like me, but if your not to fussed over listening to Elvis doing the same old songs over and over, save your money for something else.